Most babies will consume 7800 fl. oz. of formula solution (baby formula mixed with water). To make this, you will need to buy buying 48 cans of 23 OZ cans of dry formula powder. 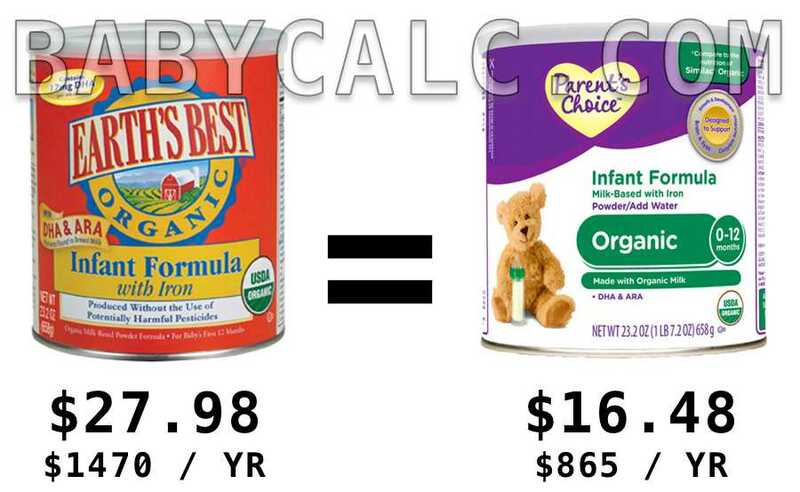 Most parents spend an average of $1470 per year on organic baby formula, buying brands like Earth’s Best or Similac Organic baby formula costs about $28 per can. Let me let you in a little known secret – Earth’s Best Organic formula and Wal Mart’s Parent’s Choice Organic formula are THE SAME THING and are both manufactured by the same company – The Hein Celestial Group, Inc (subsidiary of PBM Nutritionals) in the same Vermont production facility, using the same ingredients, and is sold to big brands such as Babies’R’us, Whole Foods, WalMart, and yes, Earth’s Best. These companies in turn private label (put their name on it) the formula and sell it to the consumer. The costs of these formulas differ greatly, with established brands selling a 23 OZ can for $27-33 while store brands (Babies’R’us, WalMart) are selling it for much less – around $17 per can, which is about 40% difference. By using unbranded product, parents will save an average of $600 per year, while feeding their children same great organic formula!